It’s bad enough that someone dies. Especially if they are young. When it occurs during the holiday season, all the jingling bells and fa-la-la-la-las are a crude backdrop for pain. The stark emptiness of loss throbs through your veins. You can barely breathe. Those who have had loved ones die at all experience a difficult enough time. “How am I going to get through everyone talking about blessings and presents?”. “I just want to shut my eyes and it be January”. Whatever scab that may have formed over the wound is ripped off. Memories of past holidays come flooding back. Gut-wrenching sobs become the lonely connection with the one who will not be there. For this holiday. Or maybe it’s too painful to feel anything. I wrote about my own parents’ deaths at Christmas in 2007. December 17th, my mom. December 24th, my dad. Going through the motions seemed paramount. After all, I had a 13 year-old who was excited about Christmas. My husband’s parents and other friends were counting on me for Christmas dinner. All the food was bought, even some prepared. I don’t remember much except trying not to cry. I hope that yours is not one of the families whose loss occurs during the holidays. But about 1/12 of you are. 1) Especially if it has been recent, allow others to help you. You could still be in shock. It is the time for receiving from those who love you. 2) Know that your grief will be unique to you. Don’t feel that you must grieve the same way others do. Everyone will be different. Do the things that take care of you. That might be distraction. It might be the doing of tasks. It might be journaling about your pain. Whatever helps. 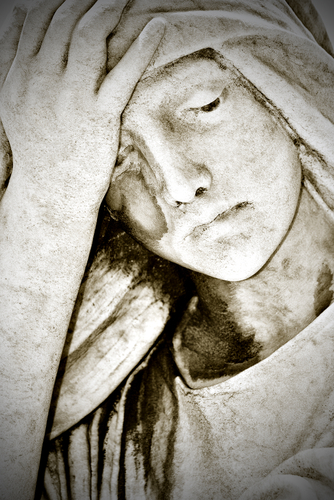 3) Understand that there are many facets of grief. Anger, denial, despondency. All of these feelings are normal. The most important thing is not to become stuck in any one of those feelings. It takes time. Frequently a lot of it. If you do find that you are trapped in anger. Or deep sadness. Please reach out. To a therapist. A pastor. A friend. Or your grief may consume you. May become how you define yourself. You can trudge through it. With the help of faith, or friends, or the knowledge that you must. If you are not going to die along with them. So you can celebrate their life. Their living. If you know someone who is grieving this holiday season, please share this post with them. And as always, thank you for reading.